I’m supposed to be in a very bad mood this week. I’m supposed to be pining away for my beloved seashore, complaining about the week that was over in a blink. Heck, I even made up a name for the disease that myself and other family members suffer when our cherished week together ends..Post Sea Isle Depression Syndrome. PSIDS. Before the official diagnosis, I suffered mightily as a small child. Driving back over the bridge leaving town, I was always turned around watching the sparkling surface of the ocean disappear, the tears spilling on the vinyl seats of Dad’s Chevy Impala. The smell of the marsh so wonderful rolling into town, now the final kick in my cut-off jean shorts. We would always, (and still do with my kids) roll down the windows and say “marshy smell, marshy smell, marshy smell..mmmmmm! !”, while taking exaggerated snorts of the heavy air . I continued to suffer for decades, right up to, but not including 2014. I don’t think you get it..this is a very, very, huge, big deal. I am not in a bad mood. I am not desperately scanning beach real estate and employment opportunities that move us to the beach, nor am I berating my husband for not buying into all of it. “Happy to be there, and happy to be here!”..I responded without rehearsal, to the puzzled expressions of a few. Who am I? I’m not 100% sure..but I think I like her. Tess is my name and gratitude’s my game. I’m pretty sure I can pinpoint the moment gratitude came to live in my soul forever too. It happened in the marsh. Morning after morning last week, me and my bicycle were pulled away from the ocean that I love so much, away from the crowded beach,the noisy waves,the throngs of boardwalkers and bikers, the lifeguards whistles, and the smells of pizza and fudge. I pedaled over to the marshes..such a tiny island, the distance to the ocean just a couple of blocks, but it may as well been a hundred miles. 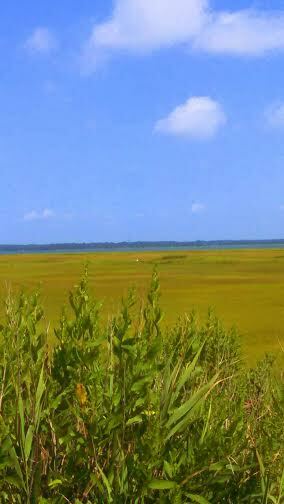 It is a serenely beautiful and timeless feeling to stand in a marsh..hard to believe I was still on the same planet as the beach frenzy that was whipping up just two blocks away. The seagulls, who appeared to be working the late shift, dotted the marsh, appearing wise and calm..a sharp contrast to their loud, thieving friends, working the morning shift, tormenting children and their ice cream cones ocean-side. The resting marsh gulls seemed to be sharing their secret with me..this was their happy place..sit a spell. With each marsh sabbatical last week, I pedaled away lighter..happier. That feeling continued over the little bridge, down the highway and right into the operating room where I work. Marshy smell, marshy smell, marshy smell..mmmmmm. from my chair of love. Spinning and bitching and stressing. paints you pink and dresses you up. lifting in the gentle ocean breeze.. I think I saw you blush. Two exhausted, sun-kissed, teenage boys returned home last night after a week of summer camp. It’s too soon. They need more time..I need more time. I mean, like, the milk didn’t even expire while they were gone. My boys had a dream week sailing, water skiing, canoeing and tubing. They dropped fishing lines in the bay and shot the breeze with their buddies under robin egg- blue skies. They bonded with cabin mates and counselors, performed in a talent show, attended a dance and played goofy, team building games. They were fed like Kings. They had the time of their lives. And…lookout..this just in..the oldest boy’s cabin got to hang out with the oldest girl’s cabin one hour after “lights out” for the rest of the camp…this blurted out by the younger, envious brother…my ashes would have been long sprinkled before older brother shared that sensitive intelligence. I expect those little nuggets of information will keep trickling out over the next few weeks..months..years. I don’t know about your teenage boys, but mine have about a 20 second window per day for “gab” time with Mom. I had a dream week too. I did NOT step one foot into the grocery store. There was no cooking, no dirty dishes, no nagging. The toilet seats were down and clean…joy and bliss. But, there it was..always something to jolt me back to gratitude. A folded letter shoved into the pocket of a very stinky pair of shorts. My only source of communication with my boys at camp..an email that the counselor prints out and delivers at mail call. How sweet..standing in my basement laundry room in the middle of the night, surrounded by a mountain of laundry that smelled like the bottom of a crabbing boat, I imagined my half-boy, half-man reading my letter, smiling, and then carefully folding it and placing it in his pocket..perhaps reaching in throughout the day to touch the words..maybe he could feel my love for him..the thought had me sniffing again. Luke? My son’s name is Matthew. I read Luke’s letter from his Mom. Luke’s Mom had it going on..she was upbeat and even sent him a list of jokes..a real cut-up. Not a single reminder to wear sunscreen. ( my letter screamed “WEAR YOUR SUNSCREEN! !”) Next year I am googling jokes for teenage boys before I hit send. Meanwhile..somewhere in another laundry room, Luke’s Mom is reading a “Dear Matthew” letter and shaking her head in disbelief at the wackiness of some Moms..
My son questioned me as I was assembling toiletries kits for summer camp. Adorable travel-sized shampoos and toothpaste..brand new toothbrushes…what 13 and 15 year old boy wouldn’t be ecstatic at my half-hour presentation on the contents of their kits and the proper application of the three different sunscreens I supplied? Mouthwash…even made myself chuckle at that one. Tomorrow is the big day, they’re shipping out..well, truthfully, they are being hand delivered by their parents to their cabins on a beautiful waterfront camp, where they will enjoy a week that I could have only dreamed of as a child. Much of their week will be spent on sailboats and water skis. Gah, I was happy when my Dad agreed to let us turn on the hose. wrap a rubber band around the handle, and place a brick on top of it..and “voila!” a sprinkler was born! Truthfully, I am happy that they want to return to this wonderful place summer after summer and attempt things that are not in their normal life..especially since air conditioning is not part of the experience..which is the only part of their camp memories that I can relate to, as I spent most of my childhood summers sticking to my sheets. Oh, right..I was going to talk about missing my kids. A few years ago I was completely wrecked dropping them off at camp. Leaving my son alone in a strange place with strangers was agony. I cried all the way home and received messages of support from other Moms for the entire trip home. I emailed my boys every day..the only form of communication.a letter delivered to them, of which they could not respond..no phones, no computers, no pigeons..nada. An ax to the apron strings. Heart wrenching. I had hugged them goodnight nearly every night of their lives up to that point..how would they survive? They wouldn’t. They did. They loved it..and it got easier every year for me. Summer camp for kids is a boot camp in “letting go” for parents. Every time they go and return with most, er, some of the things they left with, it is a small emotional victory for everyone. It makes the fuzzy college- bound kid of the future come into focus a little more. My boys are going to leave me sooner rather than later and they will survive. I am slowly starting to let go. I can’t explain why whenever I open my tea towel drawer in the kitchen and see that baby bib shoved in the back, why I can’t toss it in the donation bag. I fed you your first cereal and applesauce in that bib. Yes, my heart, I will miss you. I already miss you.